When the average person thinks of hiking, images of huge backpacks, Clif bars, and (you guessed it) full leather hiking boots come to mind. However, there has been a big switch recently to lighter and more breathable on the trail footwear. Lightweight trail runners and boots made of synthetic materials are currently some of the most popular picks for both day hikers and long distance backpackers alike. On the very far end of this spectrum lies one of the lightest and most breathable options available: the hiking sandal. 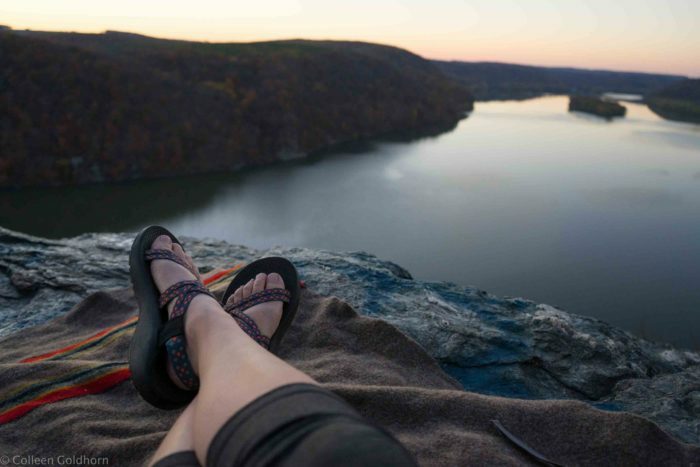 Although hiking sandals are made by more than a few reputable companies (Chacos, Teva, Keen, and Bedrock to name only a few, many avid outdoor enthusiasts wouldn’t dream of trading in their trail runners for a pair of sandals. Hiking sandals are definitely not for every hiker, or every adventure. However, I have found them to be an awesome alternative for summer hiking and an option that deserves a place in any hiker’s gear closet. Many come with full orthopedic support and traction comparable to the most rugged hiking boots. All of this paired with an open and airy top make hiking sandals are the best friend you never knew you wanted. Do you have a few big water crossings on your upcoming hike? Sandals let you walk straight through the water without missing a beat. Instead of having to take your boots on and off for every crossing, sandals let you keep on hiking and let your feet dry on the fly. Do your feet swell when you’re hiking? I know the pain all too well – instead of trying to find the perfect boot that allows your feet to swell without causing blisters, sandals let your feet swell as much as they would like without having to buy new shoes. Are your boots too heavy or chunky? Sandals are lighter and smaller than a large majority of hiking footwear on the market. Lighter shoes means less weight for your body to carry up the mountain, and therefor more energy throughout the rest of your day! Are you getting too many blisters? Blisters while hiking can come from any number of reasons, and many of them are all but eliminated while hiking in sandals. Aside from the straps, there is very little fabric to chafe from so say good bye to your hot spots! The open toe design prevents any toenails from being pounded away, and the open design let’s sweat or rain dry quickly instead of causing blisters on your feet. The only cons I have been able to find are that you can’t wear these year round in most places because bare feet and snow don’t mix too well, and that depending on the weight of your pack you may require a shoe or boot with a little extra support than sandals can offer. You stub your toe way less than you think you will, but your toes will be nice and dirty at the end of each day. Interested yet? There are tons of brands that make pretty awesome and durable hiking sandals. 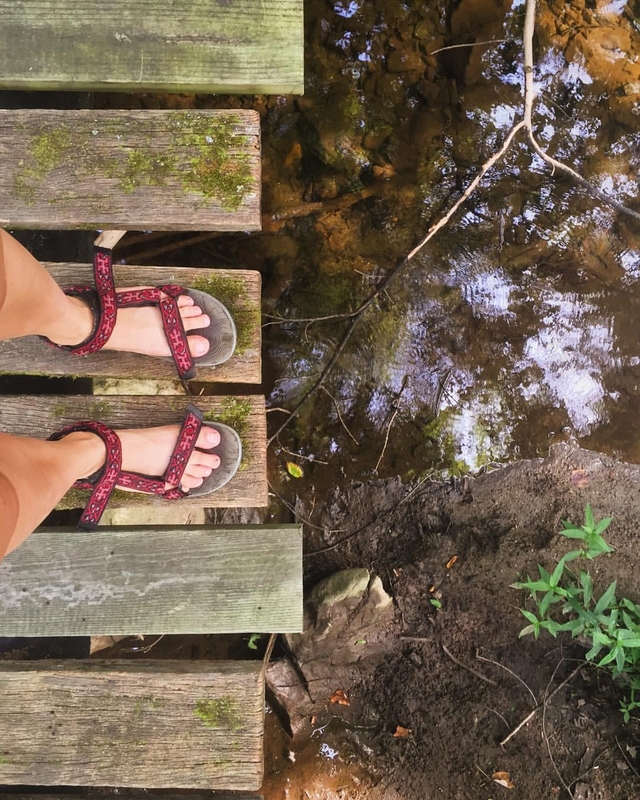 Plus those REI dividends should be coming in the mail any day now – so pick yourself up a pair of hiking sandals for this upcoming summer hiking season! Avid Chaco hiker here getting ready to thru-hike the AT! 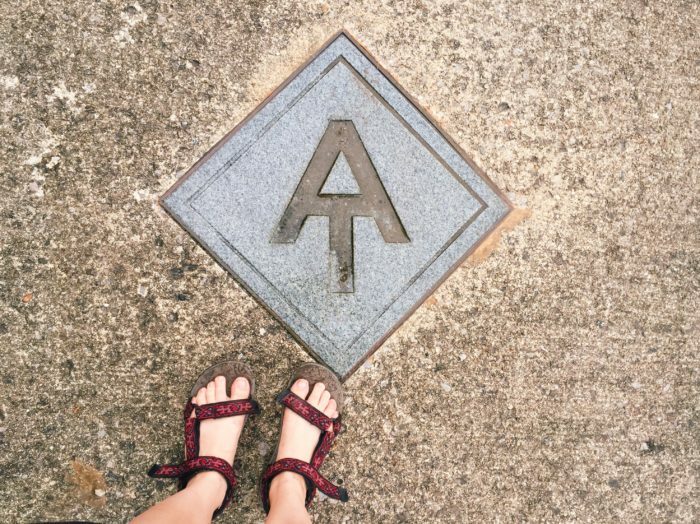 I sometimes feel crazy that my feet prefer hiking in Chacos, but it just seems to make sense, because everything you said is completely true! I hike in my chacos all the time. Great support, sticks to rocks like climbing shoes, and the Z2 soles cushion the rocks and soften the tough trails. Was totally surprised when I saw this article and couldn’t believe my eyes. Most people I run into wonder if I stub my toes…..never… But from time to time, my feet do get chilly! Great article and glad to see I’m not alone!! I have a pair of Xero Amuri Z-Treks that I will be alternating with my Merrell trail runners. Can’t wait to try them out! Regarding weight…Chacos are almost a pound heavier than running shoes (not trail runners*). They are also much stiffer and both of these qualities are quite noticeable. An old hiking saying states that an extra pound on the feet is equivalent to 5 pounds on the back in the effort is takes to move forward. The stiffness will also impair a feeling of connection with the ground when rock hoping ect… Ultimately, sandals will leave one more prone to an injury from either a slip, exposure to the environment or a possible repetitive foot injury (such as planter factious). Here are a few problems associated with hiking in sandals. 1) Stubbing a toe on a root, rock or stick is quite painful and the trail is covered in roots and rocks due to heavy usage; 2) Blisters can develop where the straps land when barefoot; 3) Dry skin from a lack of humidity can also create cracks on the bottom of the feet that really hurt (feels a bit like pins and needles). If this happens, this localized humidity problem can be corrected by wearing liners and socks while walking; and 4) more likely to become injured by accident with heavier and stiffer shoes. Picture someone slipping off a rock while rock hopping with the stiffer, thicker and treadier soles of the sandals. Vibram or lug soles are overkill for this trail and in my opinion do more damage to the environment not to mention the wearer than running shoes. My biggest concerns are the wt difference and the stiffness of the soles (Chacos). I love wearing Chacos at home, but would go for a lighter option with additional protection on a long distance hike. All this said, a few people do hike in them, but believe most folks do not wear them the entire way. Georgia does have fewer rocks than the northern states making it somewhat more feasible for hiking in sandals. I Would not recommend wearing them in the Smokies or north of Harper’s Ferry due to the rocky terrain. It is quite common to swap out gear along the way as hikers become more accustom to the trail. If you start with sandals and decide to switch over to running shoes (not trail runners*), swapping them can easily be accomplished almost anywhere along the trail. Just have them delivered to one of your mail drops or at a possible outfitter along the way (more expensive with less selection…but you will be supporting the local community). I have always hiked in running shoes (not trail runners) a size and a half larger than my original foot size. My feet did grow a full size on first thru hike and never shrunk back. They also never grew any larger on subsequent long distance trips. My running shoes are like big slippers with great ventilation. While some dust gets through all the small holes on top of the toe box, they dry out very quickly. Usually within an hour or so of dry conditions the shoes are dry. *Trail runners are heavier and have thicker soles than running shoes. They also dry out slower and provide less of a connection with the ground than running shoes. What sandals do you most prefer and why? I’ve been searching for my ideal hiking sandal for years now, because I have so many issues with toes and toenails and I have a wide forefoot and narrow heal, as well as small feet. Men’s shoes would be a better fit for me than most women’s , but they do not come in small enough sizes. Hey Vanessa – thanks for reading. I personally wear chacos. When buying, I wear a size and a half larger than my regular shoes, in addition to a wide sole. Due to your issues, maybe you can check out Bedrock sandals or the really durable models by Tevas. Although I have not personally done extensive hiking in either, I hear fabulous things from some other hikers who are hooked on sandals! I hope you find something that works for you!! In the desert Southwest​ we have a lot of rocks and crushed granite covered trails. Is there a problem with the sandles on these types of trails? I have hiked on tons of rough and rocky terrain in my sandals with very minimal problems. However, rocks really depend on the way each individual person walks – if you are regularly finding rocks in your hiking boots, then you will most likely get them stuck in your sandals as well. Personally, I never find rocks in my boots, so sandals have been working great for me! One up side about sandals though is that if you do get the rare stray rock stuck under your foot, you don’t need to take your entire boot off to get it out. Thanks for reading! Sandals, saved my hike in Peru (Salkantay)after 2nd day very bad blisters.So, glad took my sandals as backup or I would have had to drop out. Absolutely love my Uneeks by Keen. They have almost completely solved my blister problems caused mainly by sweaty feet enclosed in shoes. The reduced weight is also noticeable at the end of the day. They could stand to have a bit more traction, but the design makes toe-stubs almost impossible, and they are about as airy as footwear can get. I do wear Injinji toe socks with them to combat the grimy foot syndrome. Another pro-sandal vote. I don’t want to quarrel with anyone convinced that you need shoes or boots but enclosed shoes have been involved every time I’ve had a foot or ankle injury. I wear Chaco Z/1s as a matter of course and have logged many thousands of miles on that pattern. I’ve tried sizing up but I abandoned that practice a long time ago with no ill affect, and with added agility from true sizing. There are so many advantages beyond what our author listed that I’ll continue sandal shod marching into deep old age. I adjust to different socks depending on circumstances. If I pick up a pebble they’re easily shaken out. Trapping snow between big toe and sandal is a drag but every lifestyle choice has some downside. Hey, when the sandal phobic folks start working you over just remember that most of the hard miles walked on this planet are walked by people that don’t use shoes. Often you’ll see the subject of the dream trek photo posed next to a porter wearing sandals they fashioned from a discarded auto tire.